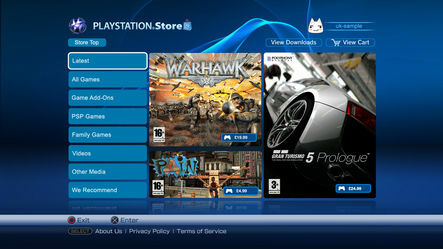 At last, YAY, Sony has finally revealed (all very officially you know), the very first shots of the new PlayStation Store, for you to peruse with your eyes at your own pleasure. The new update is said to be here this month (that’s April folks), and Sony say that we can all look forward to a special update, come mid-April. What that will be is anyone’s guess, although i personally am hoping for Home, or even a demo of the much anticipated Metal Gear Solid 4. 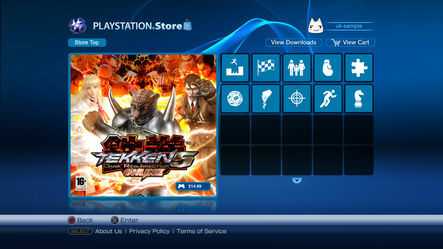 The store, it is said, will gain a new design, interface and navigation. It also stated that current users of the store will not be affected, and so they can just look forward to the new overhaul. Although this also means that anybody that has not yet downloaded the fantastic Gran Turismo Prologue (shame on you), can still do so while the new update is incorporated, OR you can find the best price for the game HERE. While you wait for the new update, you might like to view these quite nice looking screen shots of the new store layout. ENJOY.